Enchanting fresh roses of different colors in a round shaped basket. 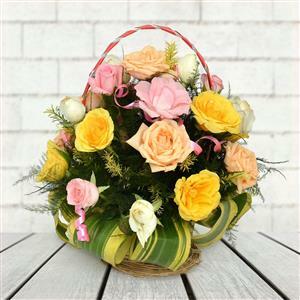 This is a beautiful flower arrangement of 6 pink, peach, white and yellow roses each which you can send to India as a gift on any occasion or festival through RGCards.com. The arrangement looks stunning and can brighten up the day of your loved ones. Send Gifts to India and let your dear and near ones enjoy each and every moment of it.